DIE Lunæ, videlicet, 8 die Augusti, post meridiem. Letter from the Earl of Warwick, about a Ship be took, laden with Arms. The Ships to be sent up. E. of Portland to be kept in safe Custody. Petition of some French Noblemen, for their Lordships Protection. Subject of the Conference about the York Petition. and for the Earl of Essex to be Lord Lieutenant of Herefordshire. Message from the H. C. to communicate Letters from Monmouthshire, at the Conference. Orders, &c. from the H. C. for the Lords Concurrence. Answer to the H. C. about them and others. Letter from St. Sebastian, about the Oppressions against the English there. Lord Mohun and others sent for, as Delinquents, from Cornwall. Message from the H. C. to send for the Earl of Bath from Devonshire, to attend the House. An Order to resist those who take up Arms against the Parliament. Affidavit of Words spoken by Jackson against the Parliament. Committed to the Gentleman Usher. Message to the H. C. to join in sending for Lord Mohun and others, as Delinquents, from Cornwall. Petition of the Duke of Vendosme, and other French Noblemen, for the Protection of this House. Order for Repayment of Money in Northamptonshire, advanced for Payment of Soldiers. Order for One Thousand Pounds to Sir John Dryden and others, advanced by them for the Service of Ireland. Sir Hen. Vane, Junior, to be Treasurer of the Navy. Collectors of the Subsidy of Tonnage and Poundage to pay Money ordered by the Committee for the Navy. Committee for the Navy authorized to order Money, raised by the Customs, or otherwise, for the Service of the Fleet. Yorkshire Petition against Sir J. Hotham, &c.
A Letter of the Earl of Warwicke was read, directed to the Speaker of this House, concerning a Ship laden with Arms and Ammunition, which he hath taken. Ordered, That a Letter be written, to give his Lordship Thanks; and that the Ship be sent up hither safely, with all Speed. "Here is come into The Downes, a Vessel of the Merchants of Dover, freighted at Amsterdam; there is in it Three Hundred Barrels of Powder, Two Brass Guns, several Cases of Swords and Rapier-blades, and a Dry Fatt full of Corslets and Head-pieces. I have caused her Sails to be taken from her Yards, and do resolve to make Stay of her (until I do understand your Lordships Pleasure) and all Vessels that come so laden with Ammunition and Provisions of War for the Merchants of Dover, for they are all Foreigners and Strangers and Papists, and, under Colour of bringing Powder to be transported into Spain, it is to be suspected that they may furnish all the Papists in England with Powder, and all Implements of War, if there be not a Care had of them, there having so much already been transported by them to St. Luker and Dunkerke, and thence immediately put into Vessels which went for the Rebels in Ireland. "I hope the Governor of Portsmouth will bring your Lordships in Mind to take a timely Course to prevent the like Inconveniency (fn. 1) from falling on these Three Castles at Deale, and the Forts at Dover; for I have heretofore intimated unto your Lordships, that they are all in dangerous Hands; and, if they should man them as Portsmouth now is, we shall not be able to get Ballast or Water here; and that some Course may likewise be taken with Upnor Castle, which is a Place of great Consequence, in respect of the Command it hath over the Navy at Chatham. From aboard The James, in The Downes, this 6th of August, 1642. The House being informed, "That the Committee for the Safety of the Kingdom, having examined some Persons, do find the Earl of (fn. 2) Portland guilty of knowing of the Business of Portsmouth:" Therefore it is Ordered, That Sheriff Garrett shall take Care for the safe keeping of the Earl of Portland, until this House give further Direction therein. 1. An Order to appoint Sir Henry Vane to receive the Money that comes in for the maintaining of the Navy. An Alteration was made in this Order, which was to be communicated to the House of Commons. Ordered, To communicate this, at (fn. 3) a Conference, with the House of Commons. To desire a present Conference, touching a Petition received from divers of the Nobility and Gentry at Yorke. The Messengers were called, and told, "That this House (fn. 4) agrees with the House of Commons in the Orders concerning Sir H. Vane, and the Committee for the Navy; to the rest, this House will send an Answer, by Messengers of their own." 2. Concerning Money advanced by certain Persons of the County of North'ton, for reimbursing Monies to them. That this House agrees with the House of Commons in these Two Orders now brought up. The Earl of Essex (fn. 5) was appointed to express, at this Conference, the Sense (fn. 6) this House hath of the Affront offered to this House by those that subscribed this Petition; and to desire that both Houses might consider of some Way to right the Parliament. Ordered, That the Lord Grey is appointed to go to the Spanish Ambassador for this House, as is desired. 2. That the House of Commons have received Information, that there are divers Horse in the County of Hereford, prepared to go Northward; and, in regard of the Sickness of that Lord which (fn. 4) was appointed by both Houses to be Lord Lieutenant of that County, the House of Commons desires their Lordships would join with them, in the Nomination of the Earl of Essex to be Lord Lieutenant for that County. Ordered, That this House agrees in the Nomination of the Earl of Essex to be Lord Lieutenant of the County of Hereford. That the House of Commons, having received divers Letters from Monmouthshire, do desire that the same may be communicated at the next Conference. The House adjourned during Pleasure, and the Lords went to the Conference; which being ended, the House was resumed. To let them know, That this House agrees with the House of Commons, in the Instructions and Order concerning New Sarum, and the County of Sarum; and to deliver to them the Order, with the Amendments, to which this House agrees, concerning the Isle of Wight. "An Abstract of a Letter, dated in St. Sebastian, in Spayne, the 21st of July, 1642. Upon reading of a Letter sent from the Committees of the House of Commons, in the County of Cornwaile, directed to the Lord Robartes; it is Ordered, That the Lord Mohun, Sir Nic. Slannyng, Sir Bevill Greenfild, John Arundell, Senior, Jo. Arundle, Junior, Sir Peter Courtney, shall be sent for, as Delinquents. That they have received Information, "That a great Peer of this House is now in Devonshire:" The House of Commons desires their Lordships would please to send for him, to attend this House, because he may do their Lordships more Service here. Ordered, That the Earl of Bath shall be summoned to attend this House this Day Fortnight, according to his Writ and his Duty. Agreed to; and Ordered to be printed and published. That this House agrees to send for the Earl of Bath, and have agreed to the Order now brought up. "That, upon Condition that Three or Four of the Parliament were hanged, he would hang with them." Ordered, That Stephen Jackson is committed to the safe Custody of the Gentleman Usher. To let them know, that, upon Information from Cornwaile, they have sent for the Lord Mohun and others, as Delinquents; amongst whom are Sir Nic. Slanning, Sir Bevill Greenvile, and Mr. Jo. Arundell, Junior, Members of their House; and the Lords desire the House of Commons would join in sending for them. The House of Commons will consider hereof, and send an Answer by Messengers of their own. "To our Much-honoured Lords, the Lords assembled in Parliament. 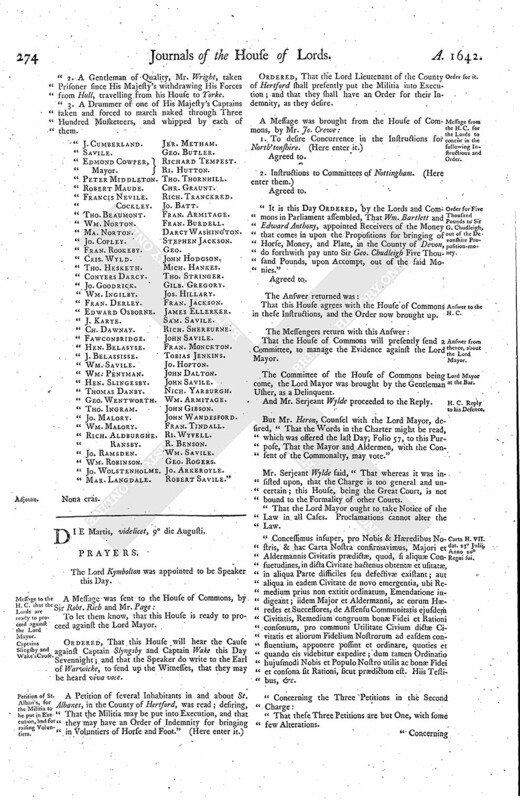 "With all Respect, do remonstrate unto you, the Dukes of Vendosme, D'Espernon, and Soubize, the Marquis of Vieuville, and the Lord of Valiqueville, That, howsoever they be remaining in and about the City of London, living freely and safely, as Strangers of their Condition, under the Public Faith, and with an Opinion that you are well pleased therewith, as hath been oftentimes testified unto them, with very much Nobleness and Civility, by many of your Lordships and Members of both Houses: Nevertheless, considering the present Estate of Public Affairs, they believe that, for a better Approbation and Satisfaction of the Public, your Declaration in Writing is necessary for them in this Behalf; and they do therefore instantly beseech you to oblige them so much, as that, according to the Leave which hath already been given them, they may continue their Abode in and about this City, so long as they shall find it to stand with the Conveniency of their Affairs, with the same Liberty and Safety which they have hitherto peaceably enjoyed; or else, if they shall desire to retire and depart out of this Kingdom, that they may likewise do it, without having Need of any other Conduct or Declaration from you than that which you shall be pleased at this present to grant unto them, conjunctively with that which you will give them for their Abode here; and that all this may be done with such Commandments and Directions as are ordinary and necessary to this Purpose, and under such Penalties as the Laws can impose upon such as shall violate the Public Faith; and that express Order may be given to all Officers, and others whom it may concern, to take Care of the Performance thereof, and to give unto us all Aid, Succour, and Favour, if we shall stand in Need thereof, upon the shewing only of your Order or Warrant, or of the true Copy therein authentically testified: And for this Favour, the said Dukes of Vendosme, D'Espernon, Soubize, Marquis of Vieuville, and Lord of Valiqueville, shall continue more and more instantly to pray unto God, for the Peace and Tranquillity of this Kingdom." "The Lords in Parliament do Declare, That the Dukes of Vendosme, D'Espernon, and Soubize, the Marquis of Vieuville, and Lord of Valiquerville, being Strangers, and Persons of Honour and great Quality, may and ought to have all Freedom to remain and abide within this Kingdom, no Offence or Prejudice being by them given to the Government here, either in Church or State; and, in case any Offence or Injury should be done unto any of them, that strict Enquiry and Examination shall be made of it, and the Parties offending punished according to Law; and all Officers, and others His Majesty's loving Subjects, are hereby required to be aiding and assisting, for the preserving of them from Wrong, and apprehending of such as shall offer them Wrong: And as for their Departure hence, whensoever they or any of them shall resolve upon it, upon Notice given, they shall have such Warrants, Passports, and other Assistance, as shall be fit, and will be requisite, for Persons of their Quality." "Die Lunæ, 8 Augusti, 1642. 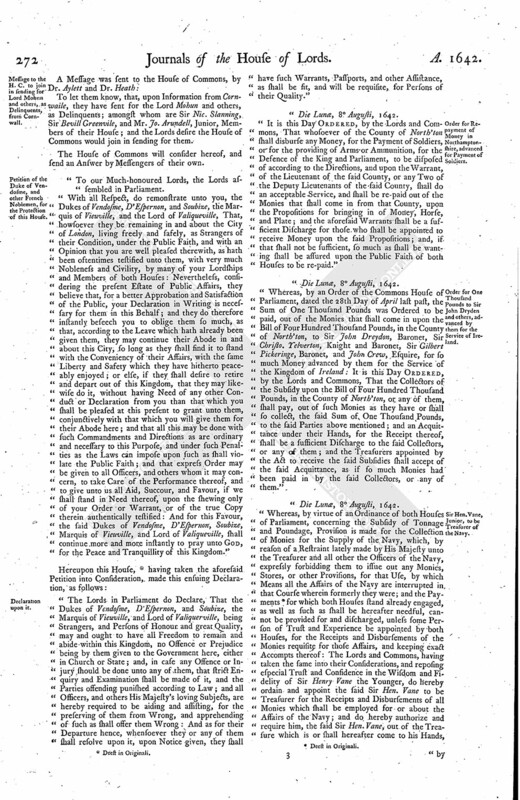 "It is this Day Ordered, by the Lords and Commons, That whosoever of the County of North'ton shall disburse any Money, for the Payment of Soldiers, or for the providing of Arms or Ammunition, for the Defence of the King and Parliament, to be disposed of according to the Directions, and upon the Warrant, of the Lieutenant of the said County, or any Two of the Deputy Lieutenants of the said County, shall do an acceptable Service, and shall be re-paid out of the Monies that shall come in from that County, upon the Propositions for bringing in of Money, Horse, and Plate; and the aforesaid Warrants shall be a sufficient Discharge for those who shall be appointed to receive Money upon the said Propositions; and, if that shall not be sufficient, so much as shall be wanting shall be assured upon the Public Faith of both Houses to be re-paid." "Whereas, by an Order of the Commons House of Parliament, dated the 28th Day of April last past, the Sum of One Thousand Pounds was Ordered to be paid, out of the Monies that shall come in upon the Bill of Four Hundred Thousand Pounds, in the County of North'ton, to Sir John Dreydon, Baronet, Sir Christo. Yelverton, Knight and Baronet, Sir Gilbert Pickeringe, Baronet, and John Crew, Esquire, for so much Money advanced by them for the Service of the Kingdom of Ireland: It is this Day Ordered, by the Lords and Commons, That the Collectors of the Subsidy upon the Bill of Four Hundred Thousand Pounds, in the County of North'ton, or any of them, shall pay, out of such Monies as they have or shall so collect, the said Sum of One Thousand Pounds, to the said Parties above mentioned; and an Acquittance under their Hands, for the Receipt thereof, shall be a sufficient Discharge to the said Collectors, or any of them; and the Treasurers appointed by the Act to receive the said Subsidies shall accept of the said Acquittance, as if so much Monies had been paid in by the said Collectors, or any of them." "Whereas, by virtue of an Ordinance of both Houses of Parliament, concerning the Subsidy of Tonnage and Poundage, Provision is made for the Collection of Monies for the Supply of the Navy, which, by reason of a Restraint lately made by His Majesty unto the Treasurer and all other the Officers of the Navy, expressly forbidding them to issue out any Monies, Stores, or other Provisions, for that Use, by which Means all the Affairs of the Navy are interrupted in that Course wherein formerly they were; and the Payments (fn. 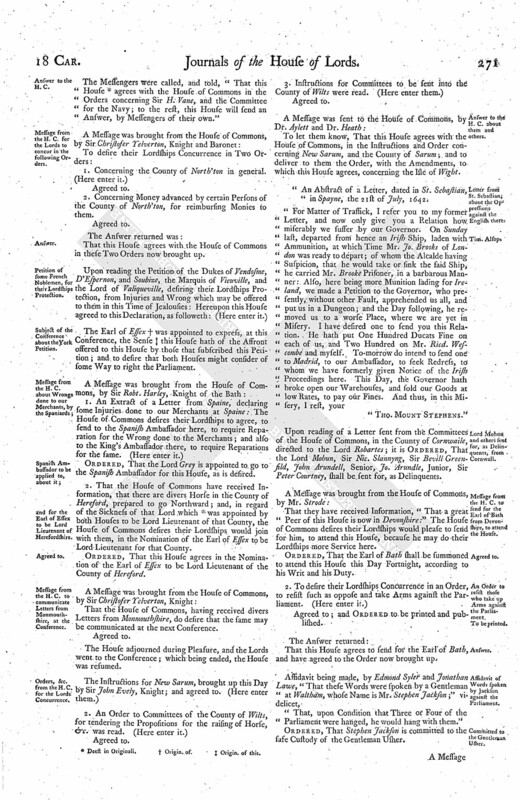 8) for which both Houses stand already engaged, as well as such as shall be hereafter needful, cannot be provided for and discharged, unless some Person of Trust and Experience be appointed by both Houses, for the Receipts and Disbursements of the Monies requisite for those Affairs, and keeping exact Accompts thereof: The Lords and Commons, having taken the same into their Considerations, and reposing especial Trust and Confidence in the Wisdom and Fidelity of Sir Henry Vane the Younger, do hereby ordain and appoint the said Sir Hen. Vane to be Treasurer for the Receipts and Disbursements of all Monies which shall be employed for or about the Affairs of the Navy; and do hereby authorize and require him, the said Sir Hen. Vane, out of the Treasure which is or shall hereafter come to his Hands, by virtue hereof, by himself, or his sufficient Deputy, to issue forth and pay all such Sum and Sums of Money, for the Affairs of the Navy, which he shall from Time to Time receive Order for from the Commons House of Parliament, or from such Committee of the Navy as they have or shall appoint, signed by the Chairman thereof, which Orders, or either of them, shall be his sufficient Discharge in that Behalf; and, for his better Encouragement herein, the said Lords and Commons do Ordain and Declare, That he, the said Sir Henry Vane, shall have and take all such Fees and Allowances whatsoever, for himself, his Clerks, and Under-officers, as any Treasurer of the Navy under His Majesty have formerly had and received, in and for the said Service: And the said Lords and Commons do further Declare, That whatsoever Monies he, the said Sir Henry Vane, shall receive and disburse for the Affairs of the Navy, by virtue hereof, according to the Orders and Directions aforesaid, together with the Fees and Allowances abovementioned, upon his Accompt made to such as shall be authorized by the Commons House in Parliament to receive the same, he shall receive a full Discharge for the same from both Houses of Parliament; and, by them, he, his Heirs, Executors, Administrators, and Assigns, saved and kept harmless from any further Question or Accompt, to any other Person or Persons whatsoever. "And, in and about the Performance and Execution of this Service, all His Majesty's Officers and loving Subjects are hereby required to give their best Aid and Assistance unto him, the said Sir Henry Vane, and his Officers under him, as Occasion shall require." "It is this Day Ordered, by the Lords and Commons in Parliament, That the Commissioners and Collectors formerly appointed to collect and receive the Customs and Subsidy of Tonnage and Poundage due, together with all other Monies which shall be advanced by Merchants upon their Entries, by Way of Loan, shall issue out such Monies, from Time to Time, as they shall be appointed to pay by Order of the Committee for the Navy of the Commons House of Parliament, for the Use of the Navy, and the Fleet now at Sea, or hereafter to be employed by Authority of both Houses of Parliament, for the Guarding of the Seas, and Defence of the Kingdom; whose Order, from Time to Time, shall be their sufficient Discharge." 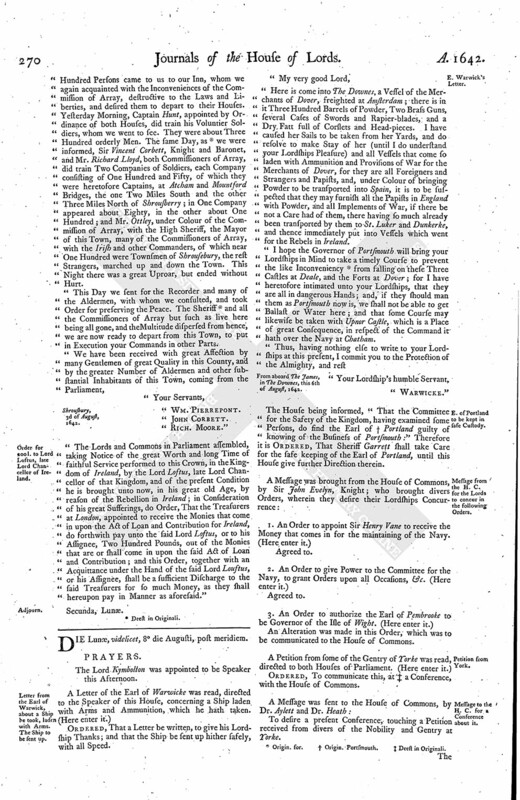 "It is this Day Ordered, by the and Commons in Parliament, That the Committee of the Navy appointed by the House of Commons shall have Power and Authority to grant their Orders, upon all Occasions, unto the Collectors of the Customs, and other Monies advanced by Way of Loan, for the issuing out of such Monies as they find needful, for the Use of the Navy and the Fleet now in this present Service, or shall hereafter be employed, by Authority of both Houses of Parliament, for the Guarding of the Seas, and Defence of the Kingdom; all which Monies so by them Ordered shall be paid to the Hands of Sir Henry Vane, Junior, Knight, appointed by both Houses of Parliament to be Treasurer of the Navy, or his Assigns, who is to receive and issue out all such Monies, from Time to Time, to such Persons and Uses as he shall receive Order from the Commons House, or the said Committee. 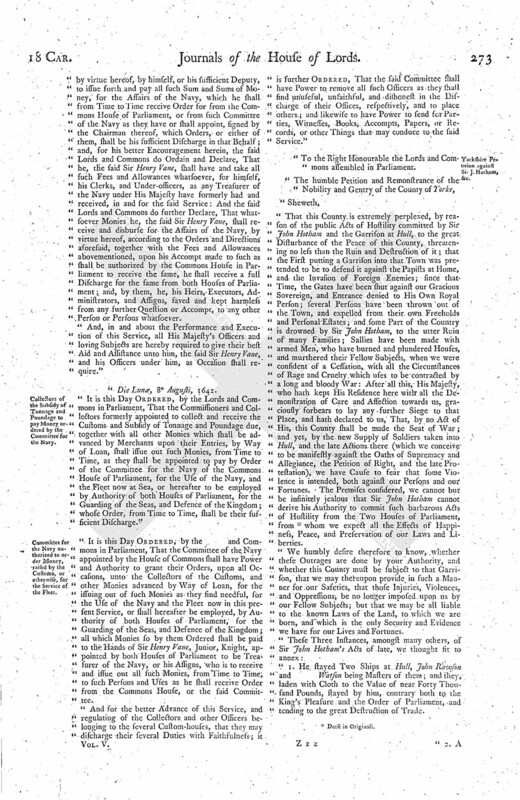 "And for the better Advance of this Service, and regulating of the Collectors and other Officers belonging to the several Custom-houses, that they may discharge their several Duties with Faithfulness; it is further Ordered, That the said Committee shall have Power to remove all such Officers as they shall find unuseful, unfaithful, and dishonest in the Discharge of their Officers, respectively, and to place others; and likewise to have Power to send for Parties, Witnesses, Books, Accompts, Papers, or Records, or other Things that may conduce to the said Service." "That this County is extremely perplexed, by reason of the public Acts of Hostility committed by Sir John Hotham and the Garrison at Hull, to the great Disturbance of the Peace of this County, threatening no less than the Ruin and Destruction of it; that the First putting a Garrison into that Town was pretended to be to defend it against the Papists at Home, and the Invasion of Foreign Enemies; since that Time, the Gates have been shut against our Gracious Sovereign, and Entrance denied to His Own Royal Person; several Persons have been thrown out of the Town, and expelled from their own Freeholds and Personal Estates; and some Part of the Country is drowned by Sir John Hotham, to the utter Ruin of many Families; Sallies have been made with armed Men, who have burned and plundered Houses, and murthered their Fellow Subjects, when we were confident of a Cessation, with all the Circumstances of Rage and Cruelty which uses to be contracted by a long and bloody War: After all this, His Majesty, who hath kept His Residence here with all the Demonstration of Care and Affection towards us, graciously forbears to lay any further Siege to that Place, and hath declared to us, That, by no Act of His, this County shall be made the Seat of War; and yet, by the new Supply of Soldiers taken into Hull, and the late Actions there (which we conceive to be manifestly against the Oaths of Supremacy and Allegiance, the Petition of Right, and the late Protestation), we have Cause to fear that some Violence is intended, both against our Persons and our Fortunes. The Premises considered, we cannot but be infinitely jealous that Sir John Hotham cannot derive his Authority to commit such barbarous Acts of Hostility from the Two Houses of Parliament, from (fn. 9) whom we expect all the Effects of Happiness, Peace, and Preservation of our Laws and Liberties. "We humbly desire therefore to know, whether these Outrages are done by your Authority, and whether this County must be subject to that Garrison, that we may thereupon provide in such a Manner for our Safeties, that those Injuries, Violences, and Oppressions, be no longer imposed upon us by our Fellow Subjects; but that we may be all liable to the known Laws of the Land, to which we are born, and which is the only Security and Evidence we have for our Lives and Fortunes. "1. He stayed Two Ships at Hull, John Rawson and Watson being Masters of them; and they, laden with Cloth to the Value of near Forty Thousand Pounds, stayed by him, contrary both to the King's Pleasure and the Order of Parliament, and tending to the great Destruction of Trade. "2. A Gentleman of Quality, Mr. Wright, taken Prisoner since His Majesty's withdrawing His Forces from Hull, travelling from his House to Yorke. "3. A Drummer of one of His Majesty's Captains taken and forced to march naked through Three Hundred Musketeers, and whipped by each of them.